I know I’m not the only one who can’t wait for autumn to officially start this week. 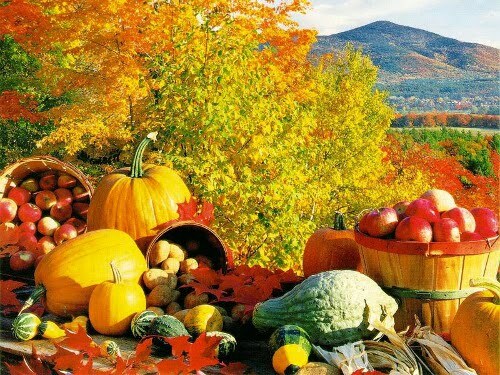 It’s about time to make apple pies, spiced cider, and butternut squash soup, and quite frankly, I can’t wait. Who cares that it’s still over 90 degrees here in the South? Now that the farmer’s markets are closing for the season and most gardens have low yields, it can be tough to know what’s in season. This time of year, there are still lots of choices for fresh produce to be eaten out of hand or in fantastic, healthy recipes! Everyone loves an apple pie, but let’s face it; they can get a little boring. My kids eat apples just about every day all year long, and by autumn, we’re all ready for a break. Pears come in absolutely beautiful varieties, from the soft and sweet Bartlett to the crisp and slightly tart Bosc. 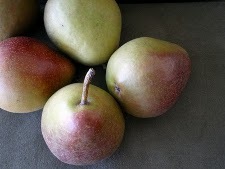 Red Bartletts look absolutely beautiful on a cheese board, and Seckel pears are small and relatively rare. There’s more goodness to the pear than just their sweet flavor and beautiful varieties, though. Pears have 30% more potassium than apples, and are high in fiber (especially pectin, an insoluble fiber that attacks cholesterol in the bloodstream). They’re also a good source of vitamin C, and well, just pretty darn tasty! While I love just eating a juicy pear and letting the juice drip down my chin, I also wanted to share two of my favorite pear recipes with you. I confess that I was a little afraid to try the quesadilla, but it’s too delicious to pass up! You can’t be surprised to see a smoothie recipe from me, right? With temperatures still in the ridiculous range in my neck of the woods, I’m happy for something spicy but still cool. 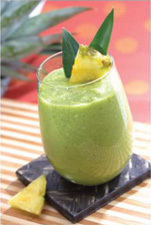 The smoothie is also great for taming inflammation thanks to the fresh ginger! On half of each tortilla, sprinkle one-fourth of the cheeses, basil, onion, and hazelnuts; top with pear slices. Fold in half and brush both sides with olive oil. Heat in non-stick skillet 2 to 3 minutes on each side or until cheese melts and tortilla browns. 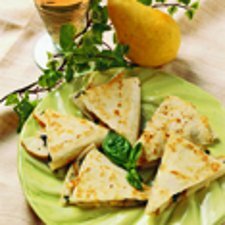 Cut each quesadilla into four pieces. Serves two as an entree, or eight as an appetizer. Combine all ingredients in a blender and process until well mixed. Makes 1 serving. Another pumpkin shortage has been reported this year, so don’t be surprised if you have a hard time finding the canned stuff at your store. The good news is that you can substitute pureed sweet potatoes or hard squashes such as butternut, acorn, and pattypan for pumpkin in most cases. Sweet potatoes will have a sweeter flavor than squash, so choose your substitute based on whether you’re using it in a sweet or savory application. Sweet potatoes have fantastic nutrition. In fact, have double the RDA of vitamin A, almost half the RDA of vitamin C, four times the RDA of beta carotene, and more fiber than oatmeal when eaten with the skin. 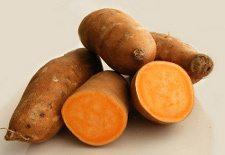 Sweet potatoes also have the lowest glycemic index of all root vegetables. How’s that for fantastic for an average of 150 calories? 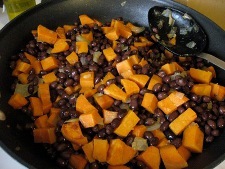 My favorite sweet potato recipe this time of year is for sweet potato and black bean burritos. I’ve made this recipe for about four years, and it’s changed a bit in that time. It sounds a little weird, but just about everyone likes this dish! One note: It tastes better if you bake the sweet potatoes rather than microwave them or use canned. Heat oil in a skillet and saute onion and garlic until soft. Stir in black beans and warm through. Stir in chili powder, cumin, and cayenne. Add sweet potatoes and mash everything to your desired consistency. If mixture is too thick, you may add a can of tomatoes or water to thin. Ro-tel works well here, too for an added kick! You may top with cheese, sour cream, salsa, guacamole. We serve it in tortillas sometimes or atop salad others. You may also add a brick of cream cheese and serve it as a dip for tortilla chips (so delicious)! You didn’t honestly think I’d leave you without a leafy green, did you? It’s the perfect time of year to see the beginnings of greens in the North, and in about two weeks you won’t be able to get away from them. The good news is that when they’re fully grown, all you have to do is wash, chop, and freeze and you’ve got months worth of green goodness with no work! I personally keep a couple of pounds of kale in my freezer to use up from last year. Since freezing doesn’t cause the same nutrient loss as other methods of preservation, you’re good to toss it into smoothies at will. Fresh is best for kale chips and massaged kale salads, though! 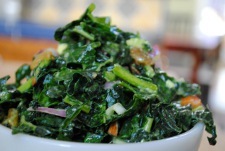 Massaged kale salad is a fantastic recipe when you’re busy. You toss it together, let it sit a day or so, and it’ll keep for about a week. When you need a leafy green fix (and believe me, when you eat enough greens you do begin to crave them), it’s there and ready to eat! Kale chips sound strange, I’ll admit. However, once you start eating them, it’s hard to stop! If you don’t have a dehydrator, bake your chips in the oven at the lowest setting until they’re crispy. They won ‘t be raw, but they will be delicious! 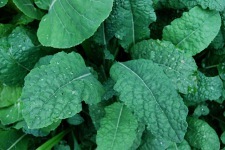 Stem kale by pulling leaf away from the stem. Wash leaves. Spin or pat dry. Stack leaves, roll, and cut into thin ribbons (chiffonade). Put kale in a large mixing bowl. Add salt, then massage salt into kale with your hands for 2 minutes. Put kale in a fresh bowl and discard any leftover liquid. Stir onion, currants, apple and sunflower seeds into kale. Dress with oil and vinegar and toss. Taste for salt and vinegar, adding more if necessary. When at desired flavor, toss in cheese. Blend all ingredients except kale in your blender. 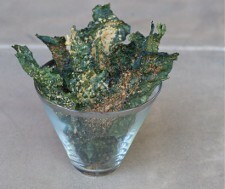 Spread kale on Teflex sheets, then drizzle with seasoning mixture. Dehydrate approximately 8 hours, then flip onto mesh sheets until they reach desired crispness! Different areas of the country experience their produce peaks at different times. It can be difficult to know what’s ready in your area at any given time, making shopping hit or miss. I hate wasting money on stuff that looks great but has zero flavor. That’s where this fantastic table comes in. It’s broken down by state and month so you can see what’s local to you! There’s so much goodness in store over the next three months, so be sure to to enjoy it in season!